Here is a look at our Christmas 2014. I love decorating for Christmas, and since this is our first Christmas in this house I had a lot of fun trying to find a place for our decorations. The table is set for Christmas dinner ahead of everyone arriving to open presents. I love getting my Christmas dishes out to use from Thanksgiving through the Christmas season. The Christmas glasses were my Moms and bring back a lot of happy memories. 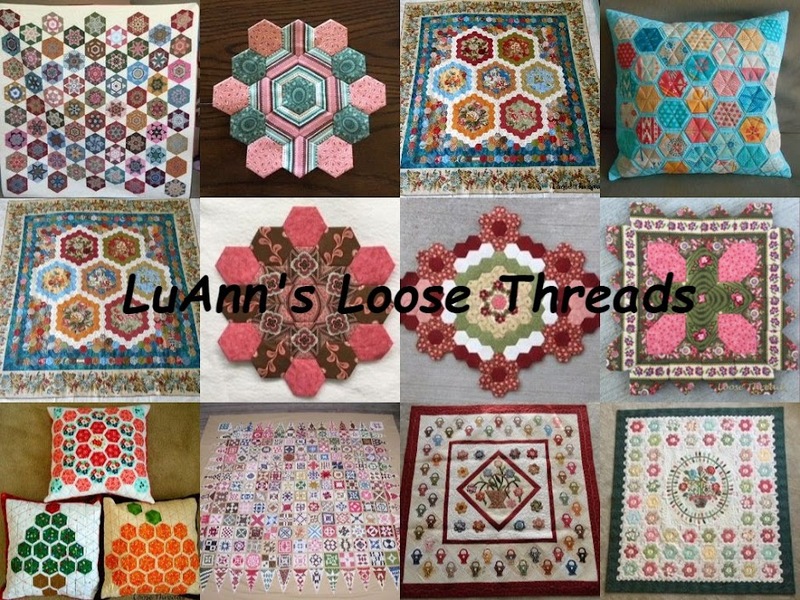 I made the table runner a couple of years ago as part of a blog hop over at Madame Samm's Sew We Quilt blog. The pattern is Holiday Lane from Jill Findley and is available under her "Free Stuff" section on her web site. Here's a closer look. I added some things to my version of the table runner. This is my Dollar Tree/Wal-Mart centerpiece. I wanted something small enough so that it wouldn't cover up too much of the table runner. I found the bottle brush trees and candy stripe trees at Wal-Mart. The silver tray, ornaments and candle are from Dollar Tree. My brother-in-law, Melvin, keeps me supplied with pine cones from the farm. I'm going to join up with Tablescape Thursday over at betweennapsontheporch.net I'm not sure I've ever done that before, but (1) I love her blog, and (2) I looked a lot of places for these small stockings so that I could use them for silverware and a candy cane at our Christmas table. I was really looking for the cable knit ones that Pottery Barn had a couple of years ago. I saw the knockoff version that someone found at Dollar Tree on Pinterest, but I couldn't find it this year. The ones I found were on the top shelf at Walgreens. The wooden box filled with greenery and candles (and more pinecones) sits on the island. My husband made the wooden box for me. I saw it over at Far Above Rubies blog (another blog I love to read) a few years ago and showed him a photo and asked if he could make one for me. I use it every year at Christmas. I found this black and white polka dot pitcher in the bakery section at the Blue Gate Restaurant in Shipshewana, IN. I have so many happy memories from that town. I keep the pitcher out all year and fill it with different things. Here is some greenery and holly with candy canes.....and more pinecones. I baked lots of cookies. And, this year I made Spiced Pecans. Here is a pan taken fresh from the oven to cool. This is the "grazing station" with the cheese ball I made, veggies, crackers and dip on one end of the island. This wreath was made by a distant cousin years ago. I made this ceramic tree back in the 70s. Here are some of my Christmas quilts. My Charming Christmas Presents (the top quilt) wall hanging tutorial can be found here. It's also linked on my sidebar. My Dear Jane signature quilt is on the bed. These quilt blocks came from a swap on one of the lists several years ago. This was the first Christmas swap. I don't know if it still continues. The pillow on the left of the bed and on the chair were made by Roswitha. My childhood friend cross stitched the other pillow for me years ago. I made the pillow in the center of the bed from Jill Findley's Holiday Lane table runner by taking just a couple of houses from the pattern. My Mom made almost all of the ornaments that are on our family tree. I crocheted the tree skirt and the afghan on the back of the chair. You can see my helper Tiki taking a rest underneath the tree. The blue tree in one of the bedrooms. The red and white tree on the back porch. We had to anchor it with bricks and bungee cord. I'll figure out something different for next year and do more decorating out there. We do our outside decorating the day after Thanksgiving while eating turkey leftovers. The family decorated around the outside of the entire house. This is what really makes Christmas special. I hope you and your family had a Merry Christmas and are enjoying the holiday week. If you are getting ready to put your gift cards on the tree and discover that you've forgotten to pick up something to put those cards in, these are really quick to make. Here is one of the Christmas Gift Card Holders that I made. They can also be used to put a motel key in to help keep track of it in your purse or pocket. The holders are 4 inches wide and 7 inches top to bottom at the widest points. So I cut two pieces of coordinating fabric about 13 inches wide and about 15 inches long. Using Wonder Under or your favorite fusible, fuse the two pieces wrong sides together. Cut into 4 inch strips. Using the template, cut out the holder. Before sewing, cut the slit in the bottom part so the top part can tuck in. The slit is about 3/8" away from the "V" in the bottom of the holder and is about 2 inches long. These look like mini envelopes. Press the bottom (with the slit) up as shown. Sew as directed and press the top flap down. You have something decorative to hold any kind of card that you want to keep track of. I made quite a few for a little something to tuck inside of Christmas cards. I know it's almost Christmas. I honestly don't know where this month has gone. I have photos to show you of my trees and some of my other decorations. I sometimes feel that I'm still decorating until it's time to put it all away until next year. Hope you are finding some time to stitch. I have been on a knitting kick since I got back from the quilt retreat right before Thanksgiving. I've knit several scarves and am participating in a Ravelry knit along. I hope you are finding some time to do some stitching today. Here are just a few more photos I found of quilts that I saw but weren't shown at the show and tell. This is Lynn's Phebe quilt in process. I believe the logs were 1/2 inch finished on her log cabin quilt. I love looking at the fabrics in scrappy quilts. This is Cindi showing her little quilt top. I love the setting. This was my show and tell at the Friday night retreat. A couple of the girls asked me to show my Road 66 quilt top. The pattern is from Di Ford's Primarily Quilts book. We have a lot of Di Ford fans in our group. Orca Bay - Bonnie Hunter's mystery quilt from 2011. My Rotherfield Greys quilt another pattern from Primarily Quilts. My Dear Jane. I have worked on this on and off for years (about 10 or 12), and it is now quilted and bound. My crown is a little crooked, but that's me. It has become tradition that when you show your finished Dear Jane at the retreat, you wear the tiara while you are at the microphone. This is the last of the Friday night show and tell. Rosemary's Di Ford Mystery Quilt. The clues appeared in each issue of Quiltmania this year. This one has a lot of her signature blocks in it. Rosemary's Civil War/repro orphan block quilt. And, her 30s orphan block quilt. Edith is hand quilting this one for MiMi. It is gorgeous!